When Jay-Z canceled a concert in Fresno, California early last week without explanation, a search for the cause quickly settled on what appeared to be an obvious one: the mogul’s 4:44 tour may not be as successful as one might expect for the hip hop legend. Evidence was there: for several upcoming shows, resale tickets are selling far below face value, with numerous tickets still available from Ticketmaster at the primary point of sale. Given that the original sale of tickets was restrictive – one got first bite of the apple by being a member of Mr. Carter’s Tidal streaming service – and the release was his 14th studio offering – it’s not outlandish to speculate that the game may have left Mr. Carter behind, at least to an extent that affects stadium tours. Beyoncé’s husband – or at least his legal team – appears to disagree. The letter points to this story from Billboard, littered with quotes from Live Nation, with whom Jay-Z signed an exclusive 10 year, $150 million deal back in 2008. Their version reads that the tour is wildly successful and low resale prices are just proof of that; they were the plan all along to price out “scalpers”. No mention was made of the Fresno cancellation or the fairly indisputable fact that – regardless of price strategy, a large number of tickets are still unsold. We demand that you correct your story both in tone and content immediately. We trust that now that you have correct facts you will not allow your errors to continue. As I am sure you are aware knowledge of a story being false is a key component of a defamation action. 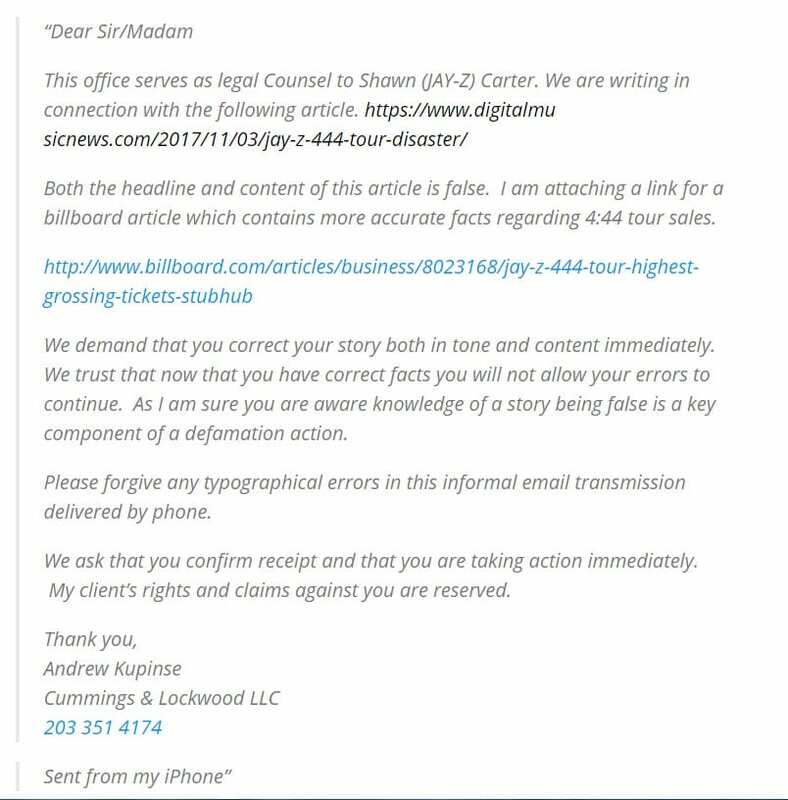 The post’s author, Paul Reskinoff, says he responded by asking Carter’s attorney, Andrew Kupinse, “to please inform [Digital Music News] which sections of the article he believes are false”, and goes on to provide screenshots of the low priced secondary inventory and widely unpurchased primary inventory on Live Nation subsidiary Ticketmaster. Whether this tour is a success or not in the eyes – and wallets – of its organizers is a difficult one to assess, depending on where tickets have been paid for already (secondary market tickets have generally already been sold off the primary and are now re-listed in hopes of turning a profit). But if the success of the 4:44 tour is being up-sold, it won’t be the first time Jay-Z has allegedly pushed a success narrative in a way that strains public credulity. In January, multiple sources, including Fortune magazine, speculated that the rapper and his team were inflating the number of TIDAL subscribers in reports on the up-and-coming Spotify competitor. It’s pretty inarguable that Jay-Z has been one of his genre’s leading lights for a generation, from album sales, to reviews, to tour numbers, to cultural impact. But it would appear at least possible that in this instance, his team is looking to make up for a sub-par outing by bullying those calling it such into submission. We’ll update this ongoing story as more information becomes available.